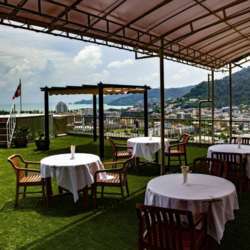 This month, we will be in a new venue, Hilltop Hotel in Patong. It's "up the back" on Ha-sip-pi road, with a roof-top terrace and bar with great sunset views over the bay. On-street parking is fine for cars; bikes can go underneath, close to the entrance door (2-palms). Then climb the stairs! John will make us welcome, and he'll provide a BBQ at 50% discount (250B) if you want to eat. We look forward to seeing you all there. Happy New Year!